This interesting, upmarket property offers 8 rooms, all with en-suite bathrooms with a large walk in shower. The downstairs rooms have French doors opening out onto verandas facing the garden, and upstairs rooms have their own private decks, offering superb views of the Tsitsikamma mountains and the village. All rooms have tea/coffee making facilities, TV with select DSTV channels, bar fridges, wall safes and ceiling fans. 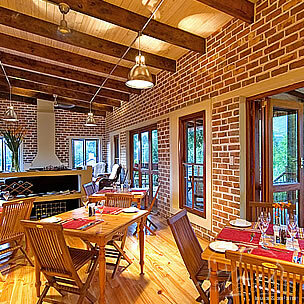 Breakfast is served in the dining room, or on the deck facing Storms River Peak, weather permitting. Guests are invited to make use of the two lounges on offer, enjoy the peace of the garden, take a refreshing dip in the swimming pool or sip a glass of wine on the large deck. There is Internet and WiFi available for guests use, as well as a laundry service. For birding enthusiasts, the Narina Trogan, Knysna Turaco (Loerie) and Victorin’s Warbler are all seen in close proximity to the village, and At the Woods Guest House can offer guided forest walks by registered tour guides from the premises. Learn about the Velvet Worm, Star Stinkhorn and other fascinating forest dwellers. Our desire is that guests will feel at home enough to slip off their shoes, whilst enjoying the attention to detail. Set in the tranquil village of Storms river, we offer 8 guest rooms, all individually decorated, with every effort made to ensure guest satisfaction and comfort. The upstairs bedrooms have their own decks, whilst the downstairs bedrooms open onto private patios. Most rooms have mountain views. Double doors and large windows ensure that the rooms are light and airy. All bedrooms are equipped with a refreshment tray, offering tea or coffee and your own bar fridge gives you access to fresh milk, cold drinks as well as storage space for your own water and fruit. 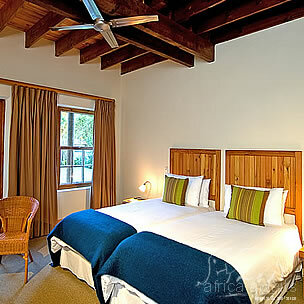 Rooms offer either twin or a king-size bed, depending on the needs of the guests. The linen is of a high standard, and beds have a duvet and blanket to ensure a comfortable night´s rest. Ceiling fans and wall heaters will keep you content, no matter what the season. All rooms have a small wall-safe for the guests´ convenience and televisions with select DSTV channels. The Guest House faces the impressive Storms River peak, and the dining room and deck encourage one to sit and enjoy the ever-changing views of the mountain. 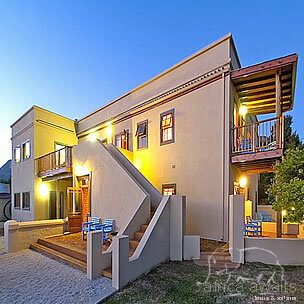 With your holiday, safari or business trip from in to At the Woods Guest House in The Garden Route.